Skips for hire near or around Surrey from Fastway Skip Hire. Fastway skips over services all over Surrey. 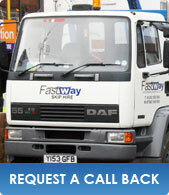 Fastway Skip hire Surrey is a trusted and reliable skip services with year of experience. Fastway drivers have thorough knowledge of local areas and its dedicated team provides the best skip service in Surrey. The team ensures skips are delivered and collected when you want without compromise on quality of service. Fastway skips is a well-established family-run business with a professional approach. The business friendly nature and ever personalised touch to something as peripheral as skips services makes them take pride as a team. Surrey skips hire, team is highly trained and helpful to our customers with dedicated service teams. The skip team provides customers useful advice on a range skip sizes. So next time you need a skip in Surrey call Fastway skip hire. Feel free and give us a call!